Eniva® Professional Formula Hip & Joint Support for Animals™ provides veterinarian recommended, ultra pure, high-potency nutrients to support healthy hip and joint mobility for active animals. This all-liquid design is formulated for enhanced absorption and performance and is an easy joint supplement for dogs and cats to take. 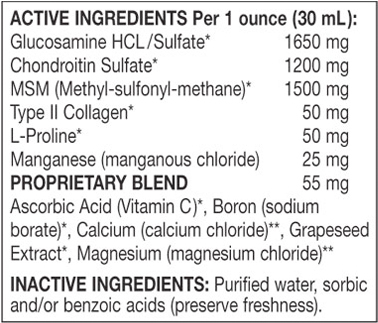 All of these high-quality ingredients combine to create one great joint supplement for dogs, cats, and other animals. Animal Hip & Joint Support - with TYPE II Collagen: Simple. FAST. Effective. • Limping – Your pet limps or tends to favor one or more of his legs. In many cases, the limping will be more pronounced when your dog first gets up from lying down. It may then become less noticeable as he walks around and gets warmed up. • Having Difficulty Moving Around – Your dog no longer jumps on the couch or has a difficult time climbing or descending stairs. • Tiredness -– You notice that your daily walks with your dog have become shorter. You may also notice your dog is sleeping for longer periods of time. • Irritability – You may notice this when petting or otherwise touching your dog in places that normally do not cause irritability. Did You Know… Glucosamine is a natural substance found in all healthy cartilage. Cartilage is the connective tissue that helps cushion your dog’s joints. But over time, cartilage usually breaks down from normal wear or injury, and often leads to joint discomfort. 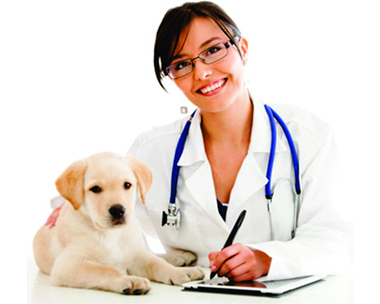 The Solution… When your pet companion suffers, a LIQUID glucosamine is recommended. Glucosamine is widely available and commonly used in both animals and humans, and it also comes in different forms. But studies have indicated that absorption into the body is fastest and most efficient when taken in liquid form. Many glucosamine pills you find on the market contain a great deal of binders, fillers and coatings that do not provide help to the joints and may in fact interfere with the absorption process. (That beef flavor coating on those store bought glucosamine tablets might fool your dog into taking the pill, but it could be causing more problems than it’s worth.) In addition, there is research that discovered some tablet forms of glucosamine don’t fully dissolve after ingestion. In some cases, up to half remains undissolved. And if your dog is older, digestive systems in elderly dogs can have difficulty in breaking down tablets and chews. With a top-quality liquid glucosamine, it's easy to pour over food, and you know it's really getting into the joint – where it needs to go for support with repair and flexibility. "We started Solo Mio and Bentley on Eniva's Hip & Joint and Omega-3 Fatty Acids well over the age of ten years old, and within a week they were as energetic and mobile as puppies! Solo Mio turned 14 in July; Bentley will be 12 in October. These supplements have extended their lives longer than we imagined, as well as allowed us to rest easy knowing our dogs are not in pain and enjoying every day to the fullest extent. Even the vet is fascinated to see how well they are doing at each check-up! We have Eniva to thank for keeping our family happy and healthy!" "Our dog, who is 13 years old, was having hip issues for several years. She gave up sleeping with us because she couldn’t jump onto the bed, and she would often refuse to go on walks with us. I started her on the Eniva Hip & and Joint, and now she actually jumps on the bed! Now, I’m the one who gets tired on the walks we started taking again. I also give her the Omega-3 oil. Thank you for improving my best friend’s last years." Directions: For daily use, refer to dosage chart below. Note: Dosage can be increased with the advice of your veterinarian. For easy application, dose may be added to animal food or water. Storage Directions: STORE IN A COOL DRY PLACE. Best if refrigerated for potency. Caution: Do not consume if tamper resistant seal is broken or missing. KEEP CAP TIGHTLY CLOSED. KEEP OUT OF REACH OF CHILDREN AND ANIMALS TO AVOID UNINTENDED CONSUMPTION.